I’ve got the vote and I’m going to use it! 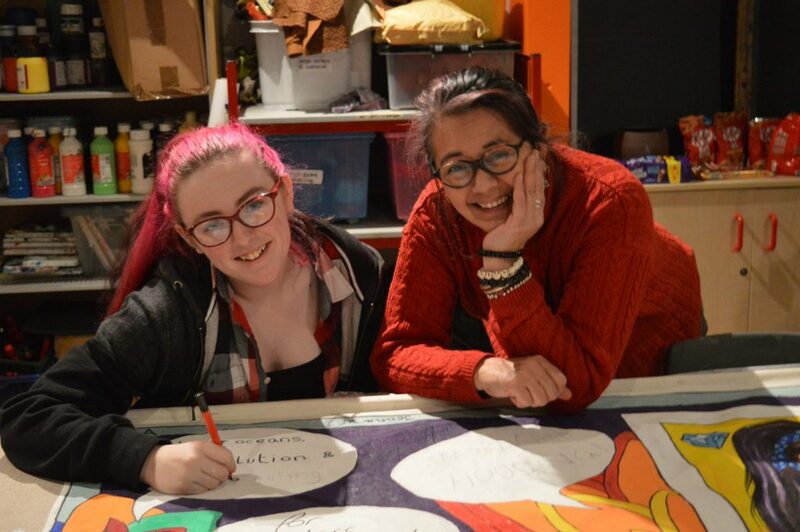 On February 16th, Ipswich Art Gallery threw the doors open and welcomed friends, families and visitors to explore the colourful, creative and challenging artwork created as a part of the Women 100 project. Lisa Temple-Cox, artist-in-residence, and Eleanor Root, Collections and Learning Curator, supported the YMCA, 4YP (Suffolk young People’s Mental Health Project), Northgate High School, Thomas Wolsey Ormiston Academy, Gainsborough Library Girls Group and 29th Ipswich Guides to create artwork exploring how women won the vote and the importance of voting today. The project’s journey was often inspiring and heart-breaking in equal measure. Many of Ipswich’s young people feel excluded and disengaged from the democratic system. When questioned they often said they wouldn’t know how to vote or simply didn’t care, which sits at odds with their articulately expressed beliefs in the importance of greater opportunities, caring for the environment and support for people at risk of homelessness. For the young people these issues were disconnected from politics and they described feeling powerless to effect positive change. The journey from disinterest to hotly debating equality and rights was a common theme amongst the workshops. When first asked if they voted, the YMCA residents said yes but only for ‘I’m a Celebrity… Get Me Out of Here!’. Yet as the weeks progressed, the young people began to express their views more readily. Women 100 has built a foundation on which further discussion and awareness needs to be built. The participants showed passion and courage in expressing their beliefs and we need to find ways that this can be nurtured and grown. This project was in partnership with the Friends of Ipswich Museums and generously funded by the Government Equalities Office.